So the time has come to find a home for this trio. I don't know if to break out the champagne, or sing myself to sleep under linen blankets. It's a bittersweet thing to be ready to let them go. The fairies of 2018, by Fig and Me. How to properly tell you all about them though. Perhaps as it's always best, let's start at the beginning. I have been making fairies since 2008. 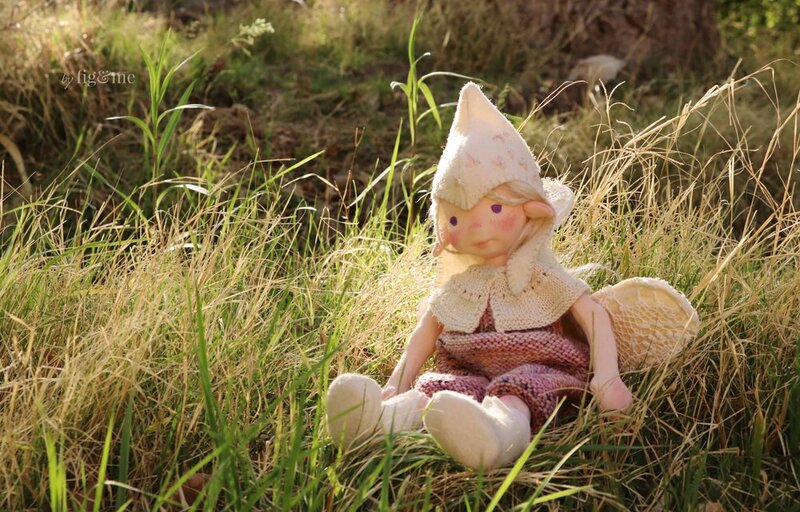 The first dolls I ever made were fairies, and it's not just because I truly believe in the presence of ultra-human or other sentient beings that co-exist with us, but it's because I have always lived my life with one foot in the real world, and the other one in a world of magic. You know this already. When my girls were little, our story time was always peppered with fairy stories. As much joy as it brought my little girls, I can honestly say I was equally enamoured with the tales. Every time we went camping I would tell my girls to leave dew drops alone and to set little baskets and settings for the fairies. It was a world of our own and now that my children are more interested in Diary of a Wimpy Kid and Inuyasha than fairy stories, I still live with one foot firmly planted there. Everything inspires me to create fairies: bread crumbs on the kitchen countertop, leaves that look like boats, the lonesome wing of a butterfly found broken on my morning walk, blooms of any kind. Nature opens its doors to me, my life always provides for interesting material to cut from, I do not need books (though I find them especially helpful) or vivid images, I just look outside. It's like the stories are always breathing there. So I set out to create another group of fairies. Lord knows they took way longer than I thought, and many were the factors at play. Committing to umpteen workshops in Europe, and trying to organize predecessors and successors in Canada and the States, finishing long overdue custom orders, and as usual, getting distracted by all manner of fabric shenanigans. Mea culpa, the fairies were being particular and I just let them take their time. They have been finished for almost a week now and though I took their photos a while ago I just couldn't sit down to write about them. Several lattes were consumed, tempting the muse to inspire me to write about them, but they were so comfortable in the studio that I kept postponing the affair. Until something happened today. I can't even tell you what it is. It just is. Today I felt like writing about them, finally bringing them here. I am so incredibly humbled by how creativity works and so intrigued by these bouts of energy that spring up and give me joyful moments of creation. So today I bring you my fairies. I hope you welcome them with open arms, they are flesh of my flesh (in cloth form) and nothing but the culmination of hundreds of souls that continually conspire behind-the-scenes to make doll making possible. Annke and Beileag, two art dolls by Fig and Me. Wool felt hat with embroidery and glass beads, by Fig and Me. For a beautiful fairy doll. 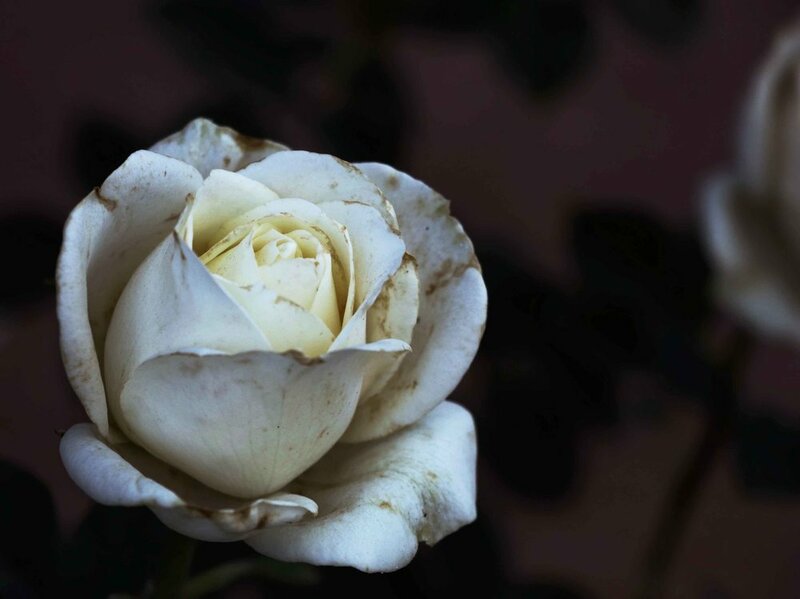 A fading rose in the garden, by Fig and Me. Annke's fairy head band by Fig and me. These three are quite a sight. They are so agreeable with each other, and though, yes, they bicker, they also play immensely well. I was thinking what travesty it is to separate them, but I know that each of them has a path in life, so I just accept that. Though they love each other, I know they will keep in touch. Fairies have special ways of communicating in time and space. Beileag, a little fairy doll by Fig and me. Let's start with Beileag, the youngest. She is full of energy and likes to take of smaller beings: snails, ants, spiders and bees. She helps them build nests, helps carry nectar, pushes heavy shell-loads up tree trunks and loves to brush all the hairy legs of her spider protegés. Beileag always consults with her older sisters before making concoctions for ailing insects and knows how to plaster cast broken legs. She embroiders the most beautiful designs on butterflies and likes to check their egg production. Beileag is an industrious fairy who never tires of her job in this life. 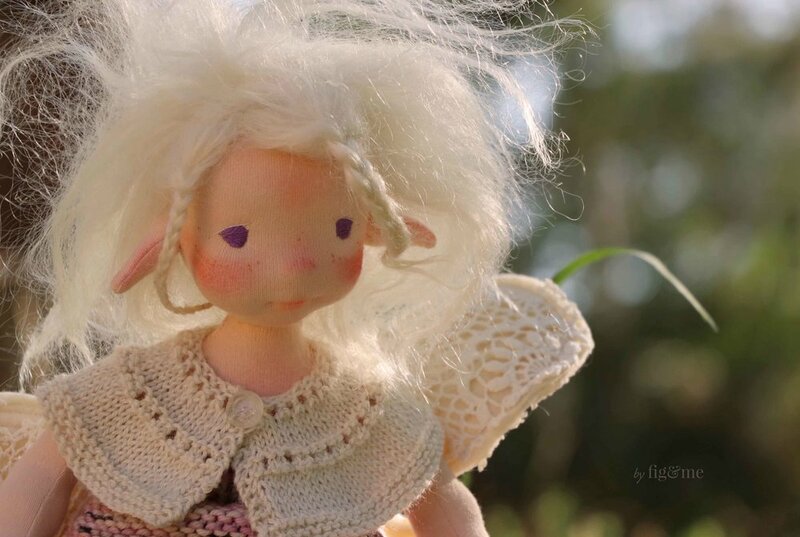 Annke, a natural fiber art doll by Fig and Me. Annke is of course, the middle sister and seems to be a math wizard. Has an uncanny ability to discern proper geometric forms, and keeps all the tendrils and fiddleheads in check. One millimetre off and Annke will let you know you've strayed from the path. 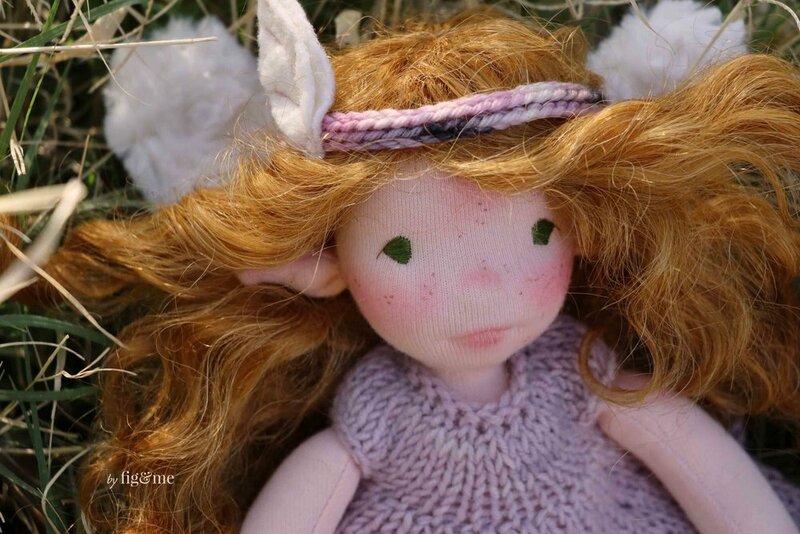 Maedhbhina, a natural fiber art doll by Fig and Me. And there's Maedhbhina, the ancient one. Oh no! I don't call her names but Annke and Beileag know her real age so that's what they call her. A sign of respect as apparently once you have white hair in fairy world means you've earned it by being one of the most helpful and kind fairies all around. So I guess Maedhbhina is a big deal. You wouldn't guess though, because she is super playful, super fun and doesn't take herself seriously at all. Is always cracking jokes and trying to lighten the mood when calamity strikes. Like, for example, the other day some poor wasp was majorly distraught; apparently, an overzealous gardener had destroyed what was the beginning of her nest. Maedhbhina took her all over the neighbourhood and helped her find more suitable real estate in which to build, got her all the construction permits and made sure she was up to snuff in eco-building techniques. So you can tell, they all have such different personalities, but all together they make a great team. Maybe that's why I was having such a hard time seating down to write about them. I felt they needed to work in unison a few more times in my garden. But we can let them go now, they've paid their dues. Beileag, a natural fiber art doll by Fig and Me. Wee fairy shoes, with felt leaves and three french knots for berries. By Fig and Me. All three dolls are looking for a loving home. Beileag (ginger hair) and Annke (brunette) are about 11,5" tall and both are weighted with glass beads in their torso. They are quite heavy. They are made with European cotton fabric, stuffed with Canadian wool and their hair is made of mohair weft, sewn by hand to a wool cap attached to their head. Their faces and bodies have been needle-felted, facial features embroidered and freckles added with fabric pens. They wear hand-knit merino/cashmere dresses, that open fully at back for easy dressing, wool shoes with felt leaves, tiny blush pink socks, fashionable headbands and the furriest of wings (which are detachable). Beileag wears bloomers and Annke wears a long skirt, both made with lovely Japanese Nani Iro fabrics. Natural fiber art doll Maedhbhina, by Fig and me. Now, Maedhbhina is a bit one-of-a-kind. I am testing a new pattern and she is about 15" tall and also weighted with glass beads in her torso. Her legs are a bit more bendy than usual due to the way they were stuffed. She is also made with same fabric as her sisters, stuffed with Canadian wool and her hair is super soft mohair weft sewn to a mohair cap. 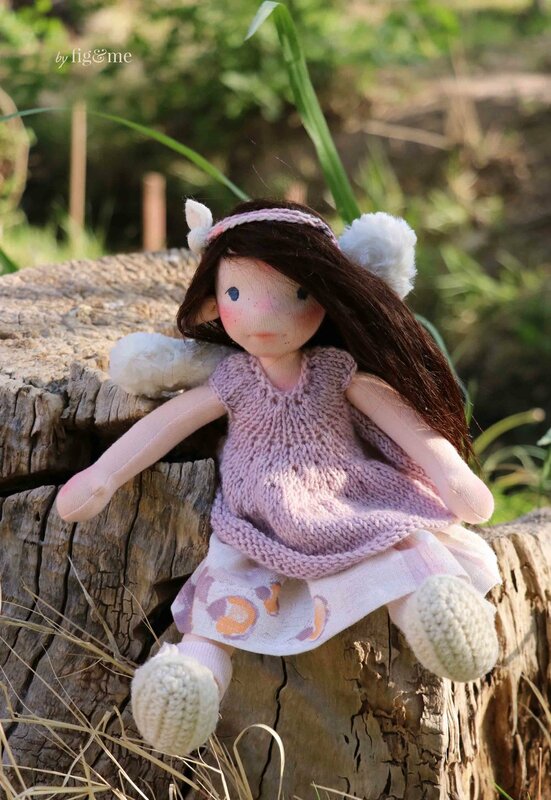 Maedhbhina has purple eyes, lots of freckles and rosy cheeks blushed with beeswax. She wears a hand-knit overall jumper thing, made with hand-dyed merino yarn. She also wears a hand-knit shawl that closes with a vintage glass button. 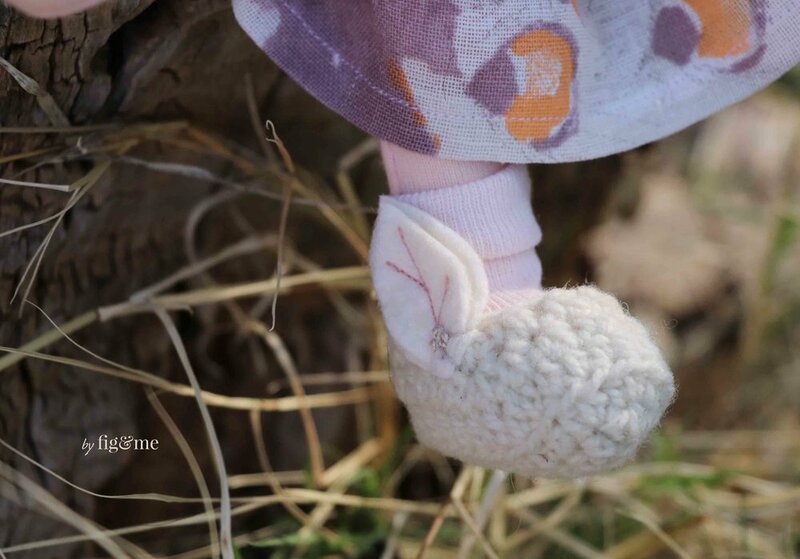 Her blush pink socks go with her white felt boots. She has a fabulous elfish hat, with blanket stitch all around, embroidered petals in pink and glass beads as accents. 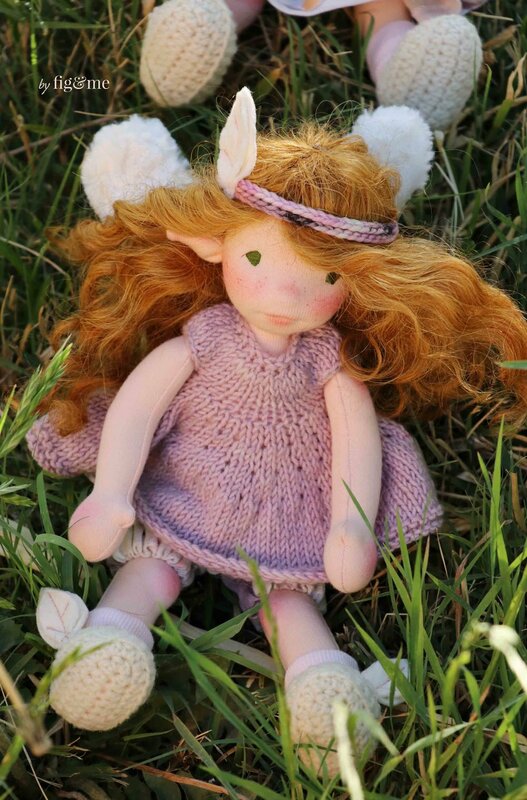 Maedhbhina has a set of wings, which are removable, made of felt and cotton crochet textiles. Annke, a Spring fairy by Fig and Me. Fairy headband by Fig and Me. Maedhbhina, a spring fairy by Fig and Me. If you would like to welcome any of these fairies into your home, please enter your details in the form below. You can enter for all three or just for the one that stole your heart, that is up to you. Annke and Beileag's individual price is $565 USD ($30 USD shipping with tracking and insurnace to the States and Canada, International will need a revised quote depending on form of transportation). Maedhbhina's price is $985 USD (same shipping quote as her sisters). We will excitedly leave this form open until Wednesday April 18th at 10 AM MST, at which point we will select names at random to purchase each doll. We will then send a congratulatory email and a Paypal invoice which is due upon receipt. - - - All three wee fairies have found a loving home. We are so excited to be sending them to their new families next week. Thank you kindly for your offers and for your unending support. Love, Fabs. Beilead, a spring fairy doll by Fig and Me. Maedhbhina, a fairy doll by Fig and Me. 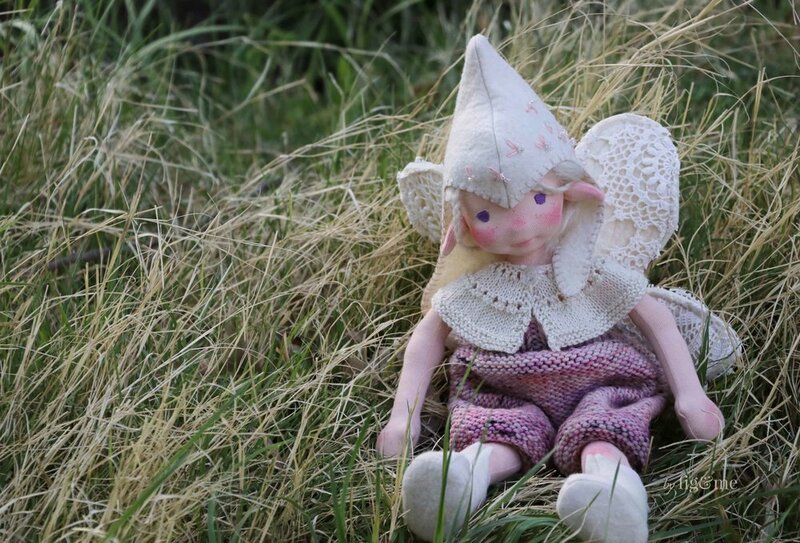 Annke, a wee fairy doll by Fig and Me. 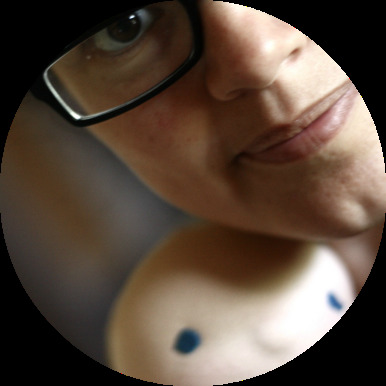 As is usual, I cannot thank you enough for coming all the way here to my blog to read stories about dolls. Thank you for your comments, your lovely feedback on my work and if you are trying to bring a sneaky fairy home, than you from the bottom of my heart for your support. It helps keep me creating, dreaming and living with one foot inside a dream world full of dolls. Much love to you all, see you on Wednesday!. Here I bring you a wee video we took when the fairies were getting ready to go and play outside. Hope you enjoy! Maedhbhina and her crazy hair, a spring fairy by Fig and Me. Apr 12 Kasumi, Sisley and Oona, three natural fiber art dolls ready to play.